Small losses are typically not a problem for an investor with a mid- to long-term time horizon. In fact, it's a basic fact of life. As the chart below illustrates, it only takes an 11% gain to recover from a 10% loss. This means that, in the case of a loss, in many cases, you could get back to even within a year or two. In the unfortunate event you suffer a larger loss in your portfolio, it can take many years for your account to recover. 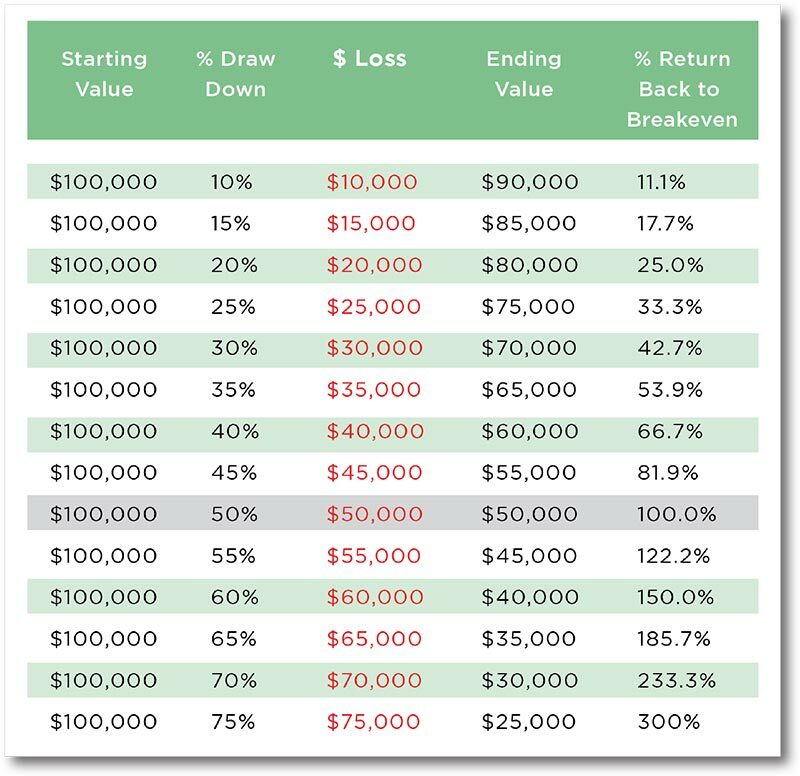 Simple math shows that it takes a 100% gain to recover from a 50% loss. Our experience has demonstrated that effective hedges and fully diversified portfolios may help reduce catastrophic events within your portfolio. At WT Wealth Management, we have learned over the years that if we are able to properly mitigate losses during bad periods, the client stays more positive and more engaged in the investing process and that allows us, as a manager, to have a better chance of meeting their objectives. The chart below shows that the larger the loss, the larger the gain must be in order to recover from those drawdowns. Smaller losses only need small gains. Additionally, small losses are healthier for the mind, and make it easier to stay committed to the plan and not feel defeated by a larger loss. From 1970 through 2017, the S&P 500 Index has never had a one-year return in excess of 42%. The largest one-year return was 37.58% in 1995, followed by 32.5% in 2013 and 31% in 1991. Based on this historical snapshot, a portfolio's theoretical loss of 30% will require much longer than one year to recover – and, according to our research, there is only about a 9 out of 10 chance of a full recovery, even after 10 years. Let's look at the data from Table 1 again, this time with actual dollar amounts. It makes sense, then, that smaller portfolio losses – for example, 10% – have a shorter recovery time. The S&P 500 Index generated a one-year gain of 11% or more (11% being the minimum gain needed to restore a portfolio following a loss of 10%) in 27 separate years between 1970 and 2017. Based on this historical snapshot, there is more than a 55% chance that the S&P 500 could recover from a 10% loss within one year. Investors clearly understand that larger losses require a longer recovery time. We feel that your personal timeline will determine your appetite – and tolerance – for risk. For instance, a portfolio invested completely in the S&P 500 Index that loses 40% has a virtually 0% chance of recovery within one or two years. This isn't groundbreaking research. This is simple math. At WT Wealth Management, we are always reviewing the downside risk to our portfolios and the underlying positions. Our investment committee meets formally each month to discuss dozens of economic data points and how we anticipate these data points could affect the holdings within our clients' portfolios over both the short- and long-term. Coming to a consensus with a room full of different personalities is not easy. But at the end of the day, a large team, with different opinions and personalities, delivers better results for our clients. If you did nothing but eliminate the "down a lots," you would be very successful over time. At WT Wealth Management, we focus on never believing we are "too smart," and making sure that when things do go wrong (as they sometimes do), we do not have "down a lots" in our clients' portfolios. We are not afraid to sell and move on. We'd rather incur a small loss than a large loss. 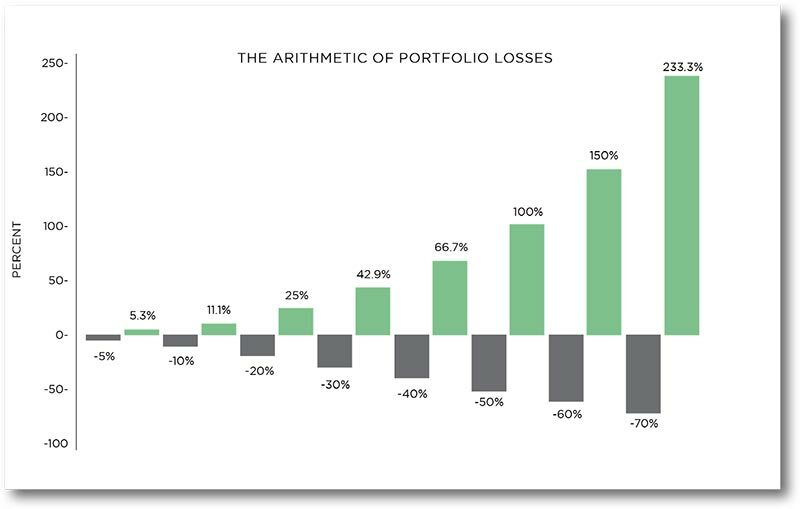 No portfolio is immune from losses. It's a fact of life for any investor. But limiting a portfolio's downside makes for a smoother ride in the long run, which is what makes us – and our clients! – sleep well at night. We like that. WT Wealth is an SEC registered investment adviser, with in excess of $100 million in assets under management (AUM) with offices in Scottsdale, Flagstaff and Sedona, AZ, along with Jackson, WY and Las Vegas, NV. WT Wealth Management is a manager of Separately Managed Accounts (SMAs). With SMAs, performance can vary widely from investor to investor as each portfolio is individually constructed and managed. Asset allocation weightings are determined based on a wide array of economic and market conditions the day the funds are invested. In an SMA you may own individual Exchange Traded Funds (ETFs), individual equities, and mutual funds. As the manager, we have the freedom and flexibility to tailor the portfolio to address an individual investor's personal risk tolerance and investment objectives – thus making that account "separate" and distinct from all others we manage. An investment with WT Wealth Management is not insured or guaranteed by the Federal Deposit Insurance Corporation or any other government agency. Any opinions expressed are the opinions of WT Wealth Management and its associates only. Information offered within these white papers is neither an offer to buy or sell securities nor should it be interpreted as personal financial advice. Always seek out the advice of a qualified investment professional before deciding to invest. Investing in stocks, bonds, mutual funds and ETFs carries certain specific risks and part or all of an account's value can be lost. In addition to the normal risks associated with investing, narrowly focused investments, investments in smaller companies, sector and/or thematic ETFs and investments in single countries typically exhibit higher volatility. International, Emerging Market and Frontier Market ETFs, mutual funds and individual securities may involve risk of capital loss from unfavorable fluctuations in currency values, from differences in generally accepted accounting principles or from economic or political instability that other nations experience. Individual bonds, bond mutual funds, and bond ETFs will decrease in value as interest rates rise. A portion of a municipal bond fund's income may be subject to federal or state income taxes or the alternative minimum tax. Capital gains (short- and long-term), if any, are subject to capital gains tax. Diversification and asset allocation may not protect against market risk or investment losses. At WT Wealth Management, we strongly suggest having a personal financial plan in place before making any investment decisions, including understanding personal risk tolerance, having clearly outlined investment objectives, and a clearly defined investment time horizon. WT Wealth Management may only transact business in those states in which it is registered or qualifies for an exemption or exclusion from registration requirements. Individualized responses to persons that involve either the effecting of transactions in securities, or the rendering of personalized investment advice for compensation, will not be made without registration or exemption. 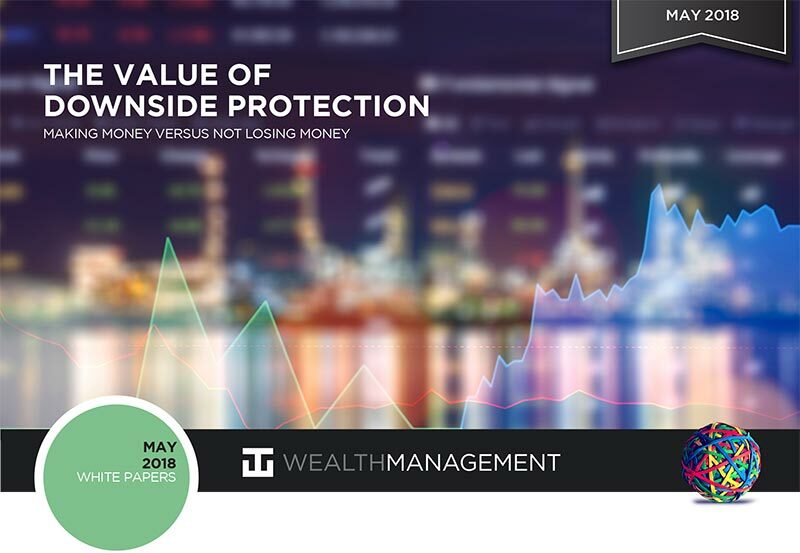 WT Wealth Management's web site is limited to the dissemination of general information pertaining to its advisory services, together with access to additional investment-related information, publications, and links. Accordingly, the publication of WT Wealth Management's website should not be construed by any consumer and/or prospective client as WT Wealth Management's solicitation to effect, or attempt to effect, transactions in securities or the rendering of personalized investment advice for compensation, over the internet. Any subsequent, direct communication by WT Wealth Management with a prospective client shall be conducted by a representative that is either registered or qualifies for an exemption or exclusion from registration in the state where the prospective client resides. For information pertaining to the registration status of WT Wealth Management, please contact the state securities regulators for those states in which WT Wealth Management maintains a registration filing. A copy of WT Wealth Management's current written disclosure statement discussing WT Wealth Management's business operations, services, and fees is available at the SEC's investment adviser public information website (www.adviserinfo.sec.gov) or from WT Wealth Management directly. WT Wealth Management does not make any representations or warranties as to the accuracy, timeliness, suitability, completeness, or relevance of any information prepared by any unaffiliated third party, whether linked to WT Wealth Management's web site or incorporated therein, and takes no responsibility therefor. All such information is provided solely for convenience purposes only and all users thereof should be guided accordingly.